Trophy sword and bottle of vodka to be won! Come play with us…you know you want to…. 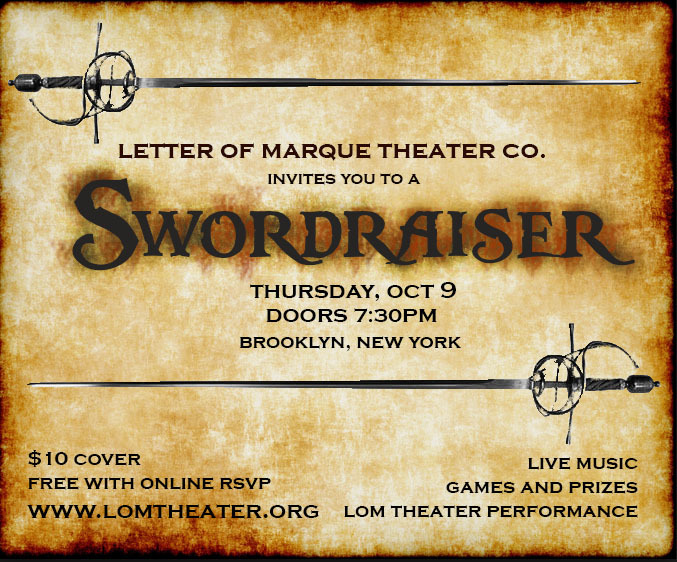 Support new Art and Letter of Marque Theater Company by joining us for our season 2 kickoff event Swordraiser: The Games We Play. This performance party will be centered around games and live entertainment of all sorts. Board games, gambling games, bedroom games… you never know what might happen when your favorite piratical thespians host a shindig! All proceeds procured get us that much closer to our matching grant! $1 off every drink! Including the delicious selection of Smuttynose beers, wine, cocktails and Cpt. Welland’s signature Foggy Grog! Shh! Super secret performance of a short play by Letter of Marque Theater Co.
Captain Scarlet’s LoM directing debut! Starring Welland H. Scripps and Nolan Kennedy, this hilariously unusual (and slightly incendiary) short play deals with white people, marriage and the “problems” that can arise. Curtain is at 8PM so get there early! We are so f-ing thrilled to welcome mandolin genius Samuel Day as our musical guest! From old time folk, to blues and jazz his famous fingers will tickle, tug and tremble your ju-ju’s in two sets of great sounds. Oh, and did we mention he’s come aboard as our Music Director for our next full-length show, Gifts?? He’s bringing the best of Brooklyn’s acoustic frontier. First set at 9PM. The most fun way to offend your friends and family! A naughty and vulgar version of Apples to Apples, this simple card game will determine who goes home with the coveted Trophy Sword (and a bottle of Vodka!). A $10 donation to LoM enters you into the party-long tourney and pits your awfulness against your opponents. Your points will be recorded by our Scorekeeper so you can come and go from the tournament as you please! Warning: this game is overt, derisive, inflammatory and downright terrible for the soul. May the filthiest win! Blackjack, Caribbean Stud, & Uno! Bet…er… donate your paycheck at our tiny funny-money casino! The tables will be felted, the cards delt(ed) and the good times felt(ed). Cash in your chips for prizes and free drinks! Games open all night long.